With no reviews on Google as of 1st December last year, they now have 10 and a score of 4.6 out of 5. Well done Paul and his team! But most important of all, how was this achieved? Fiona Christie, here at HelpHound, must take some of the credit. She noticed that they were getting some great reviews to their own website, but those reviews were not making it to Google. Once Paul and his team had spoken to Fiona the results began to flow. Do exactly what Paul and his team are doing, and there's no reason that you won't look just as good - on your own site and on Google. 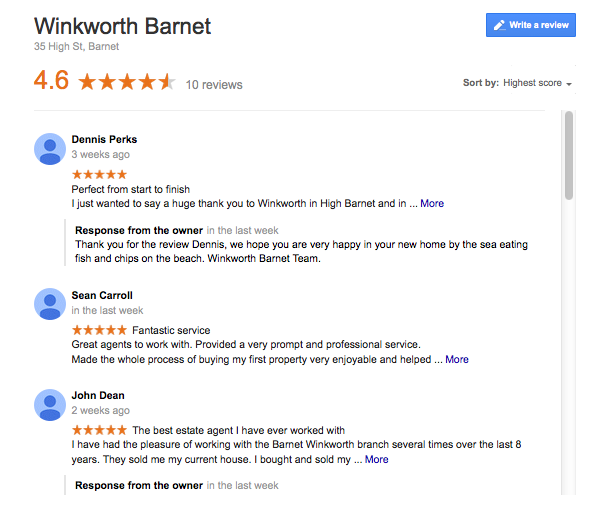 And, for those of you worrying about how clients respond to being asked to write a review, we don't think we can better the words of another Winkworth owner, this time from West London: "Don't worry about asking your clients to write the reviews - they positively welcome the invitation!"